Every year, Father’s Day provides a Sunday (in the US it’s always a Sunday) for pastors to challenge men to be better dad’s and husbands. 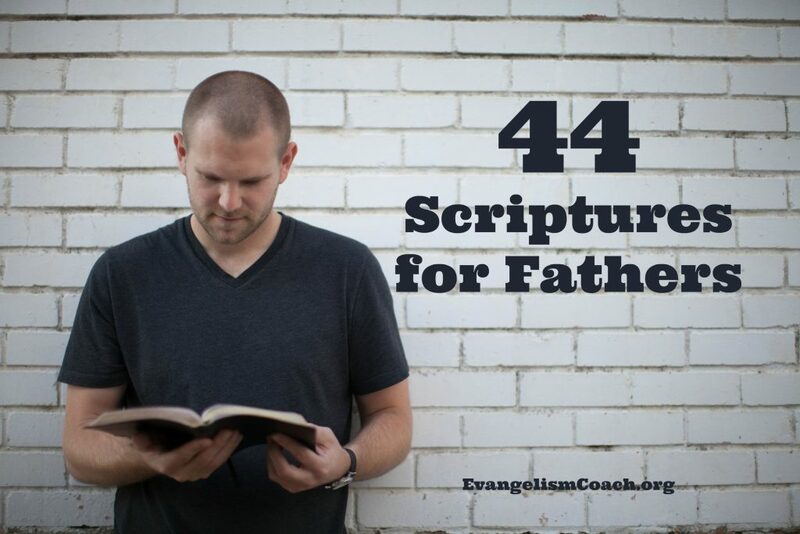 Here is a quick list of scriptures that might be useful in a sermon or message for Father’s Day. Genesis 2:24: That is why a man leaves his father and mother and is united to his wife, and they become one flesh. Deuteronomy 24:5: If a man has recently married, he must not be sent to war or have any other duty laid on him. For one year he is to be free to stay at home and bring happiness to the wife he has married. Psalms 101: I will sing of your love and justice; to you, Lord, I will sing praise. I will be careful to lead a blameless life- when will you come to me? I will conduct the affairs of my house with a blameless heart. I will not look with approval on anything that is vile. I hate what faithless people do; I will have no part in it. The perverse of heart shall be far from me; I will have nothing to do with what is evil. Whoever slanders their neighbor in secret, I will put to silence; whoever has haughty eyes and a proud heart, I will not tolerate. My eyes will be on the faithful in the land, that they may dwell with me; the one whose walk is blameless will minister to me. No one who practices deceit will dwell in my house; no one who speaks falsely will stand in my presence. Every morning I will put to silence all the wicked in the land; I will cut off every evildoer from the city of the Lord. Psalms 119:105: Your word is a lamp for my feet, a light on my path. Psalms 128:3: Your wife will be like a fruitful vine within your house; your children will be like olive shoots around your table. Proverbs 1:1-4: The proverbs of Solomon son of David, king of Israel: for gaining wisdom and instruction; for understanding words of insight; for receiving instruction in prudent behavior, doing what is right and just and fair; for giving prudence to those who are simple, knowledge and discretion to the young- let the wise listen and add to their learning, and let the discerning get guidance- for understanding proverbs and parables, the sayings and riddles of the wise. The fear of the Lord is the beginning of knowledge, but fools despise wisdom and instruction. Listen, my son, to your father’s instruction and do not forsake your mother’s teaching. They are a garland to grace your head and a chain to adorn your neck. Proverbs 5:15: Drink water from your own cistern, running water from your own well. Proverbs 5:18: May your fountain be blessed, and may you rejoice in the wife of your youth. Proverbs 5:19: A loving doe, a graceful deer? may her breasts satisfy you always, may you ever be captivated by her love. Proverbs 14:23: All hard work brings a profit, but mere talk leads only to poverty. Proverbs 18:22: He who finds a wife finds what is good and receives favor from the Lord. Proverbs 20:6: Many claim to have unfailing love, but a faithful person who can find? Proverbs 25:15: Through patience a ruler can be persuaded, and a gentle tongue can break a bone. Proverbs 31:10: A wife of noble character who can find? She is worth far more than rubies. Malachi 2:15: Has not the one God made you? You belong to him in body and spirit. And what does the one God seek? Godly offspring. So be on your guard, and do not be unfaithful to the wife of your youth. Matthew 5:28: But I tell you that anyone who looks at a woman lustfully has already committed adultery with her in his heart. Matthew 5:32: But I tell you that anyone who divorces his wife, except for sexual immorality, makes her the victim of adultery, and anyone who marries a divorced woman commits adultery. Matthew 6:14-15: For if you forgive other people when they sin against you, your heavenly Father will also forgive you. But if you do not forgive others their sins, your Father will not forgive your sins. Matthew 19:5: and said, ‘For this reason a man will leave his father and mother and be united to his wife, and the two will become one flesh’? John 10:11-13: “I am the good shepherd. The good shepherd lays down his life for the sheep. The hired hand is not the shepherd and does not own the sheep. So when he sees the wolf coming, he abandons the sheep and runs away. Then the wolf attacks the flock and scatters it. The man runs away because he is a hired hand and cares nothing for the sheep. Romans 12:1: Therefore, I urge you, brothers and sisters, in view of God’s mercy, to offer your bodies as a living sacrifice, holy and pleasing to God-this is your true and proper worship. 1 Corinthians 7:2-5: But since sexual immorality is occurring, each man should have sexual relations with his own wife, and each woman with her own husband. The husband should fulfill his marital duty to his wife, and likewise the wife to her husband. The wife does not have authority over her own body but yields it to her husband. In the same way, the husband does not have authority over his own body but yields it to his wife. Do not deprive each other except by mutual consent and for a time, so that you may devote yourselves to prayer. Then come together again so that Satan will not tempt you because of your lack of self-control. 1 Corinthians 16:13: Be on your guard; stand firm in the faith; be courageous; be strong. Ephesians 4:31-32: Get rid of all bitterness, rage and anger, brawling and slander, along with every form of malice. Be kind and compassionate to one another, forgiving each other, just as in Christ God forgave you. Ephesians 5:23: For the husband is the head of the wife as Christ is the head of the church, his body, of which he is the Savior. Ephesians 5:25-28: Husbands, love your wives, just as Christ loved the church and gave himself up for her to make her holy, cleansing her by the washing with water through the word, and to present her to himself as a radiant church, without stain or wrinkle or any other blemish, but holy and blameless. In this same way, husbands ought to love their wives as their own bodies. He who loves his wife loves himself. Colossians 3:19: Husbands, love your wives and do not be harsh with them. 1 Thessalonians 5:9-10: For God did not appoint us to suffer wrath but to receive salvation through our Lord Jesus Christ. He died for us so that, whether we are awake or asleep, we may live together with him. 1 Timothy 3:12: A deacon must be faithful to his wife and must manage his children and his household well. Titus 1:6: An elder must be blameless, faithful to his wife, a man whose children believe and are not open to the charge of being wild and disobedient. Hebrews 13:4: Marriage should be honored by all, and the marriage bed kept pure, for God will judge the adulterer and all the sexually immoral. James 1:23-25: Anyone who listens to the word but does not do what it says is like someone who looks at his face in a mirror and, after looking at himself, goes away and immediately forgets what he looks like. But whoever looks intently into the perfect law that gives freedom, and continues in it-not forgetting what they have heard, but doing it-they will be blessed in what they do. 2 Peter 1:21: For prophecy never had its origin in the human will, but prophets, though human, spoke from God as they were carried along by the Holy Spirit. 1 Peter 3:7: Husbands, in the same way be considerate as you live with your wives, and treat them with respect as the weaker partner and as heirs with you of the gracious gift of life, so that nothing will hinder your prayers. 1 John 2:27: As for you, the anointing you received from him remains in you, and you do not need anyone to teach you. But as his anointing teaches you about all things and as that anointing is real, not counterfeit-just as it has taught you, remain in him. Will they hear the gospel clearly that day? Will the gospel impact their life? Will the sermon and worship experience leave your visitors wanting to come back next week and bring a friend? You are welcome. Glad I could share some bible quotes.